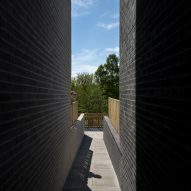 Scottish firm McGinlay Bell used low-cost concrete bricks to create the black and white walls of this canalside housing development in the West End of Glasgow. 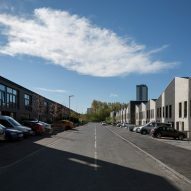 The Maryhill Locks project involved the creation of 40 terraced homes for private sale. 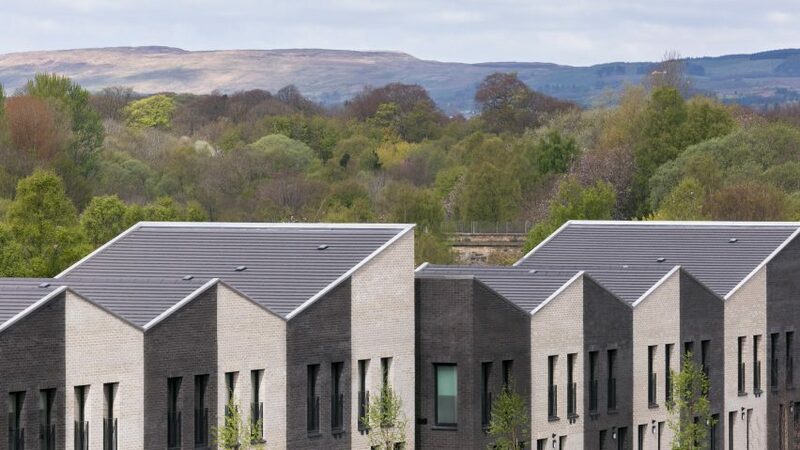 Locally based McGinlay Bell designed the houses for developer Bigg Regeneration, which is a partnership between Scottish Canals and responsible real estate business, the Igloo Regeneration Fund. 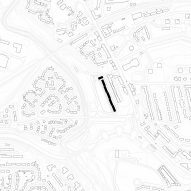 The developer's key concern was to provide comfortable homes at an affordable price point, while maximising the number of properties that could be accommodated on the narrow brownfield site. This led the architects to develop a proposal that combined prefabricated structures with low-cost building materials. 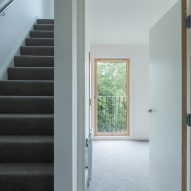 They specified a timber-kit system that facilitated off-site manufacture and reduced the overall cost of the project. 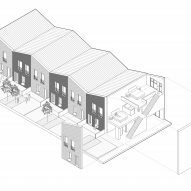 "Working with a mass-housing contractor was interesting and made us focus on trying to push through small details," Brian McGinlay, co-founder of McGinlay Bell told Dezeen. 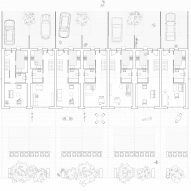 The client also requested that the buildings should be robust and in keeping with the hardy tenements that are the archetypal form of much housing in Glasgow. So, instead of standard clay bricks, the architects clad the terrace entirely in concrete bricks, which offered more robustness while keeping the cost low. 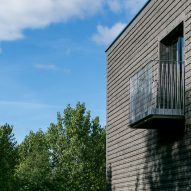 "The concrete bricks allowed us to have some fun by using black and white to introduce variation that helps to keep the sense of scale down and adds a decorative element to the project," McGinlay added. Large windows are incorporated into both the front and rear facades of the buildings, ensuring that the interiors feel bright and spacious despite their compact dimensions. "Within a narrow plan that is on the edge of spatial standards, we managed to achieve good natural light thanks to the floor-to-ceiling glazing, which was a bit of a win for us," said McGinlay. 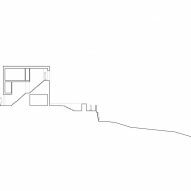 The pitched-roof form of the terrace references traditional tenements, as well as a traditional house profile. This standard volume is adapted in different scales to create two, three and four-bed configurations. 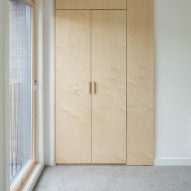 Internally, plywood detailing is used for cabinet doors and balustrades to enhance the bright and warm feel of the interiors. These surfaces complement the wooden internal window frames. Maryhill Locks forms part of a wider masterplan to regenerate a former brownfield site beside a canal in the Maryhill area. The houses were built in two phases, which helped to mitigate commercial risk on behalf of the developer. As the first phase reached completion, the money generated from sales helped to finance the second phase. 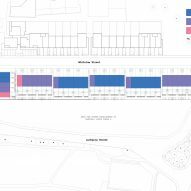 The project represents the third stage of the overall masterplan for the site, with a further phase that will provide 33 additional homes scheduled to begin on later in 2018. Photography is by Dapple Photography.